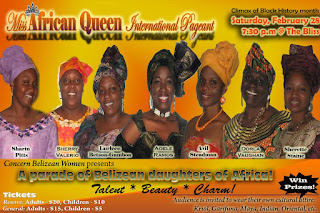 The pageant promises to be exciting. It opens with all delegates dancing to a punta medley, and then each person introduces herself...next is the talent segment: each has to depict a woman of African descent; from anywhere in the world...the talent is either a monologue or dance. Each delegate must also present a platform statement: Why am I proud to be a Belizean of African descent? Should you need more info...please write back. Tickets are available at the Bliss or from me...663-3174...If you are in the City, I can drop them off for you...but C.O.D. por favor! I hope that you can support this venture, and moreover come out and enjoy something different, something fun, and something empowering!!! HAVE ANYTHING NEWSWORTHY TO SHARE?